Arab state treatment of the Palestinians, with the partial exception of Jordan, has been the silent disgrace of the Arab-Israeli conflict. The bulk of the refugees fled in 1948-49 and the great majority of them are now dead; what are called "Palestinian refugees" are nothing of the sort, but the children, grandchildren, and great-grandchildren of refugees. Year after year, they are born into "refugee camps" or are otherwise kept apart from the mainstream society (I document some of the disabilities they suffer in one country at "Restrictions on Palestinians in Lebanon") – all for the purported reason of keeping them ready for "return" to a hoped-for Palestine and to keep them handy as a dagger poised against Israel's very existence. This maltreatment has gone virtually unremarked for decades. Must yet more generations be born before Arabs conclude these people need to allowed to live normal lives in the places they were born? In reverse chronological order, this weblog entry follows calls made for settlement of Palestinians. 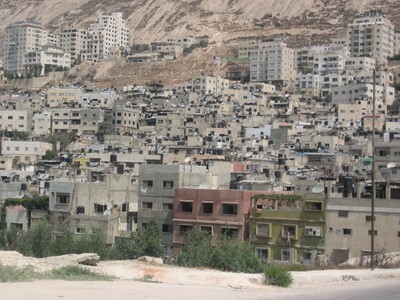 Ein Beit el Ma refugee camp in Nablus.